This week’s hunt for rural stories of interest uncovered two interviews definitely worth sharing. 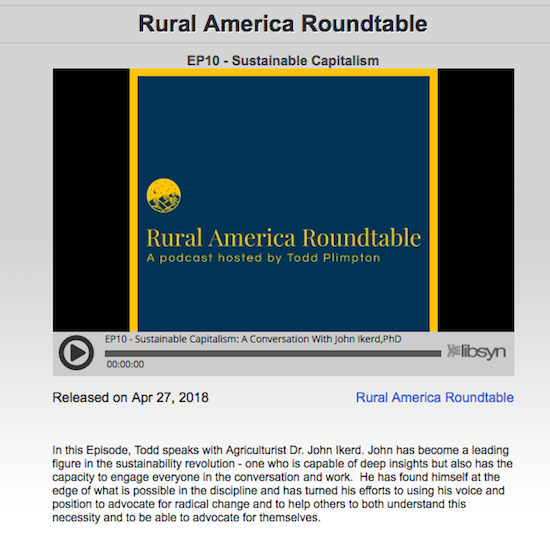 The first, courtesy of the Rural America Roundtable podcast with Todd Plimpton, is a conversation with agricultural economist, professor and author John Ikerd. The second, produced by the hard-rock music magazine Revolver, is a short four part video series with Maynard James Keenan—the eccentric lead singer of Tool, A Perfect Circle and Pucifer—about his lesser-known winemaking and community-building efforts in the Black Hills of Yavapai County, Ariz.
Often featured on Rural America In These Times, Ikerd, now in his eighties, was raised on a small dairy farm in southwest Missouri before electricity and indoor plumbing reached that part of the state. He received B.S., M.S. and Ph.D degrees in agricultural economics and worked for a time in corporate agribusiness before going into academia. According to his bio, during the farm crises of the 1980s, Ikerd “experienced first-hand the failures of the policies he had been advocating to farmers.” He then shifted the focus of his work to sustainable agriculture and economic sustainability. “Sustainable Capitalism,” linked to below, explores the economic and cultural disconnect that’s taken place since the industrialization of agriculture in the 1950s, and what it will take to repair the damage. Keenan, 53, is the frontman for two of the most successful the hard rock bands in the world. But in 1981, inspired by Bill Murray’s character in Stripes, Keenan joined the U.S. Army so he could go to art school on the G.I. Bill. His first band to make it big, Tool, formed in 1990 and has sold millions of records since. A Perfect Circle formed in 1999 and released their first record in 14 years last month. Despite international fame, Keenan could walk down most streets without getting recognized—even in the pre-internet music industry heydays, he avoided (and often ridicules in his lyrics) Hollywood. In 2004, Keenan founded Caduceus Cellars, a farm and winery in the tiny town of Jerome, Ariz. (Editor's note: even as a longtime Tool fan, I didn't know about Keenan's work in Jerome until I saw him speak at the Business Alliance for Local Living Economies conference a few years back in Phoenix.) “The Art of Work,” streaming below, is about the importance of doing work that matters to us and how doing it the right way can transform a community for the better. In short, though Ikerd and Keenan come from radically different backgrounds, they've come to some pretty similar conclusions about the state of our economy and culture. You can click here to check out the Ikerd interview. For more information about Rural America Roundtable and its host, retired Brigadier General Todd Plimpton, visit ruralamericaroundtable.com. To learn more about John Ikerd's work, books and upcoming speaking engagements, click here. I have to say that I don’t blame anybody for making the decisions that we were making, in terms of trying to make agriculture more efficient by turning it into a business—by industrializing it. The basic idea was that we were going to create profit opportunities for innovative farmers and those profitable farming operations would support viable rural communities. The most important thing was that we were going to make good food affordable to everyone. That’s what I really believed, that’s what motivated me more than anything else: We bring down the cost of agriculture production, we bring down food costs and basically do away with hunger…well, we didn’t do any of those things. We’re still as dependent on agriculture—upon the people out here on the land that are farming and growing crops and livestock—as we were when we were a hunter and gatherer society. It’s just that our connections are more complex, less direct and we kind of lost our sense of that connectedness. I think it’s critically important to our future, not only as a nation but the future of humanity, that we understand the kind of agricultural system we have—understand its implications not only in the present in terms of economics, but its implications as far as the future of our country and humanity is concerned. To those of us who are serious about it, what sustainability means is meeting needs for the present without diminishing opportunities for the future.